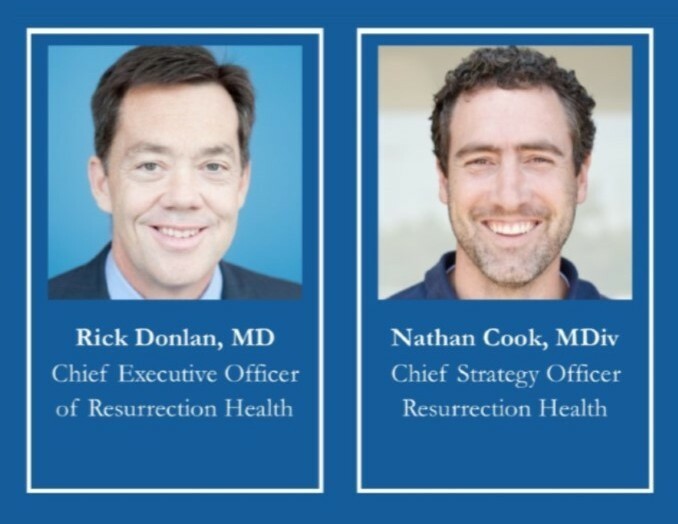 The Theology, Medicine and Culture initiative, along with the Triangle Christian Medical and Dental Association, Intervarsity Graduate Student Fellowships at Duke and UNC, and the Samaritan Health Center present For What Is Seen Is Temporary: A Conversation with Resurrection Health’s Rick Donlon and Nathan Cook, Moderated by Martha Carlough. This evening will be an opportunity to explore practical theology and service as health care practitioners through the lens of Resurrection Health and integrated, incarnational care. Rick is a co-founder of Resurrection Health and works in the clinical setting daily as a primary care physician. Previously, he helped found and grow Christ Community Health Services, a primary care health center for the poor in Memphis’ most medically underserved neighborhoods. Nathan is a graduate of Asbury Seminary, and an elder and co-founder of a network of house churches in the inner city of Memphis, TN. Martha is a full professor in the Department of Family Medicine and MCH Department of the School of Public Health at UNC/Chapel Hill. She worked in Nepal for almost a decade and volunteers with Samaritan Health Center and World Relief locally. Resurrection Health provides quality health care for the underserved of Memphis and Shelby County, TN. Their mission is to be a community of Christian disciples using health strategies to restore spiritual, physical and social well being among the world’s most marginalized by developing leaders and providing compassionate care.